The ZMF II Digital Chess Clock has modern, bright LED display technology, stainless steel touch sensors and a durable plastic case that is made here in the USA! 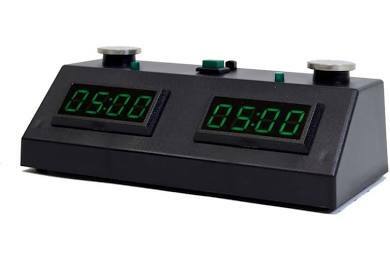 This clock was designed from the ground up to offer the features that all backgammon playrs both demand and need! For example, its plastic case is features a low-profile design for maximum stability with minimal weight, and it features anti-slide rubber feet. The ZMF II is great for anyone - fun for kids, classes, and clubs. It is very easy to use - You can learn all of the features of the clock within a few minutes. Turn sound and lights on or off, Low power consumption means 1600 hours of use in normal conditions with 4 C batteries (not included - available separately). One Year Warranty against manufacturing defects. Made in USA.